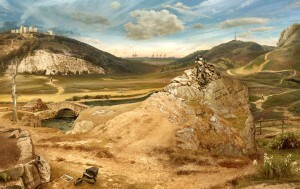 These pastoral scenes show expansive vistas with an environmental message. Worldscape (after Patinir) for example, pays homage to Joachim Patinir (c.1480-1524), the first Flemish painter to regard himself primarily as a landscape painter. 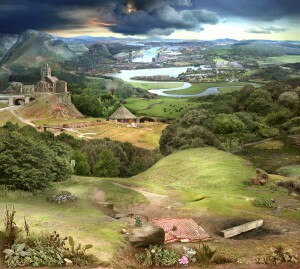 Her recreation adopts Patinir’s distinctive ‘world landscape’ style, typical of Northern Renaissance landscapes, to create a hybrid contemporary English landscape from numerous photographs of the Lake District to the South Downs. There is an overt environmental message with her deliberate inclusion of a ‘Low Emission Zone’ sign, distant wind farm, the Thames Barrier, City Airport and a demolition digger and protest site with burning tree, set against a potentially threatening apocalyptic sky.